The final update for this year is now online. Also we have added another newspaper article. William Finger (b. 1956) was killed in a car crash at the young age of 19, read the article. The site has been updated. This time we have added another line of Fingers, Gustav Finger who came to New York from Germany in 1882. Also, see the article about the Sinking of the Steamship Evening Star. This ship sank off the coast of Georgia in a hurricane in 1866. Robert Finger was the chief engineer, and his brother Lansing was the First Assistant-Engineer. Viola Tears (b. 1925) married John Blakesley, grandson of Mary Eva Finger (b. 1856). Some descendants changed the spelling to Thiers. We have added an article about John Henry Fingar (b. 1845), who while married, ran off and eloped with the wife of James Sigler. And we added a picture and noted the passing of Mary Hull the wife of Howard Fingar. 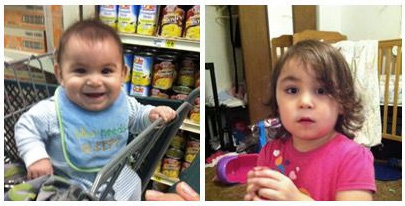 An updated picture of my own grandchildren, Landyn, 6 months and Elissa, 2½ Finger. The database has been updated. Included in this update is some corrected and additional information concerning Philo Gifford (1851-1900). Philo was married to Emma Fingar (1861-1918). Previously, we had him entered twice, once as a son and once as a husband. Those entries have been combined. Also, we found some information about how he died in a boating accident in 1900, just a short time after the census was taken. The database has been updated. Included in this update is the addition of another line of Fingers. Louis Finger, was born in Austria in 1890 and came to New York in 1907. He married Tessie, and had 3 children. Of particular interest is that his son Milton, who was born in 1914, changed his name to Bill, and went on to become a co-creator, along with Bob Kane, of the Batman comic book series. However, he never received proper credit. Read his biography. We have added an article concerning the Descendants of Francis M. Finger. Francis was born in Germany in 1814, came to the U.S. in 1853 and settled in Indiana. One descendant later moved to Missouri and his descendants remaind there. We added Webster Finger, who was born about 1842 in Hudson, New York and who died in 1892. In 1872 he married Kathryn "Kitty" Kinney. We know he didn't have any children but we don't know who his parents were. Click on his name to see his obituary, with a good amount of information. We have been able to locate and add another family line to the website. Martin Finger, who was born in Germany abt. 1831, came to the U.S. in 1856. He served in the Civil War and received a pension for illness he contracted during the war. After the war he was found on census records with various occupations such as Peddlar, Saloon Keeper, and Huckster. His wife, Ann Mary Wagner died just before age 33 (1872) when she was told that a young boy had drowned while crossing a bridge. She assumed it was her son (it wasn't) and she staggered and fell. She died later that night. Earl Finzar of Syracuse, formerly of Geneva, has been promoted to district director of the New York State Board of Mediation of Syracuse area. He assumed his new duties on March 16. Mr. Finzar was business representative for the Geneva Federation of Labor here for nine years. He moved from Geneva in December, 1945, and was employed as labor mediator In Albany. He later organized the office in Buffalo, and in 1948 was transferred to Syracuse, where he has been for four years. The above is from the Geneva Daily Times in April, 1952. I want to thank you for the information you have posted. I have been searching for my great great grandfather's information and finally found it under Morris Landis, my grandmother's brother. My grandmother, Grace Landis Wade, mother Marjorie Wade Guttke. My name is Norma Guttke Drews. I was searching for David F Landis and had no idea the F was for Finger. My mother Marjorie passed away in 1984 here in California. I am an only child and am 80 years young. My father's name Elmer G Guttke. I now live in Ca but originally from Illinois. We used to travel to Pontiac to visit Uncle Morris and Aunt Isis after my Grandmother Grace passed. Just wanted to tell you I can now follow some of my family line for my children. David F. Landis, Norma's great-grandfather, was born about 1850, the son of Phebe Ann Finger and James Landis. Also we have found a source of newspaper articles from New York, covering the years from about 1835 to the 1980s. There are many obituaries, wedding announcements, and items of interest. These have been transcribed rather than using the original newspaper image, so that they can be indexed. As an example, see the marriage announcement in the notes section. We have added another line to the website, Frank Finger who came from Darmstadt, Germany to Buffalo, New York. Not much else is known.